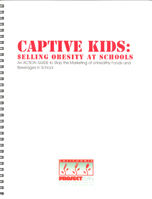 California Project LEAN believes that schools should serve as a safe haven from unhealthy food and beverage messages. Food and beverage marketing influences the diets and health prospects of children and youth and numerous national and international organizations have called for changes to the way the food industry markets its products to kids. 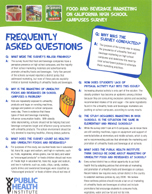 California Project LEAN works with school districts and school stakeholders to address and limit the marketing of unhealthy foods and beverages on school campuses. talking points, case studies, fact sheets, additional resources and more. This tool kit was produced as a result of the growing public concern over the obesity epidemic and the role that marketing plays in establishing eating patterns. California youth, like their peers across the country, continue to face a serious nutrition and physical activity crisis. This is why California Project LEAN along with other health advocates believe that schools should serve as a safe haven from unhealthy food messages and are calling for restrictions on advertising of unhealthy foods and beverages to children and youth. California Project LEAN identified and quantified the types of marketing and advertising on selected California school district campuses. 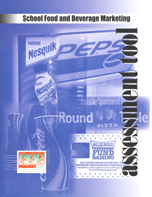 This tool assesses food and beverage advertising in schools. The results of this assessment will be useful to health professionals and educators who are concerned about children’s health and the types of food messages they are exposed to in schools. These resources provide brief details about the challenges and opportunities around marketing on school campuses. This report provides the research and background that supported the development of our marketing in schools campaign.